Jamming your smartphone or tablet into a keyboard dock and letting your inner writer loose is a great way to churn out amazing creative material. However if you only have one keyboard for all devices then it actually breaks the rhythm when you have to keep syncing it with different devices continuously. Not any more because the Logitech Bluetooth Multi-Device Keyboard is here to kick all your syncing problems away for good. 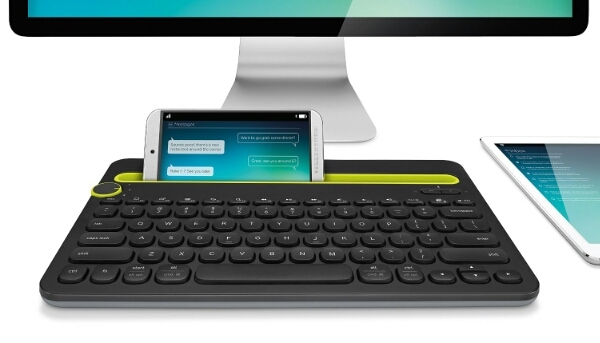 You don’t have to attach different devices all the time because this keyboard will simultaneously connect with up to 3 devices. The product uses Bluetooth technology for connection and supports different platforms including Android, iOS, Windows, Mac, and Chrome OS. A switch on the side allows you to choose the active device to work on. The product also sports a compact cradle to hold your smartphone or tablet at a suitable viewing angle. The Logitech Bluetooth Multi-Device Keyboard is available for $49.99 via Amazon.